This template includes video lessons with corresponding tasks for trainers and volunteers to complete with their horses, conference calls, and in-person clinics. The program uses natural horsemanship techniques, which focus on communicating with horses in a way the animals understand and is led and supported by Trevor and Tara of Carter Ranch Horse. The lessons cover topics from “catching” untamed horses to preparing equines for farrier and veterinary visits, to evaluating them under saddle. Every year the topics covered expand, providing a Plan 4 Progress ® to advance the knowledge and skills of dedicated organizations. The Doris Day Equine Center in Murchison, TX was home to the very first horsemanship clinic held exclusively for equine rescue trainers in 2013. Twelve rescue groups were represented at that training, and with the continued support of the Doris Day Animal Foundation and the Humane Society of the United States, the program has grown to include 35 organizations and has provided education, training and assistance to over 1500 equines and volunteers across the United States. Rescues find that the program allows them to be more consistent and efficient, because everyone at the organization gets the same information about how to approach and handle horses. The program, especially through its clinics, has given rescues powerful networking opportunities. As more groups join and spread their knowledge to their peers, the HSUS hopes these methods will become standard for rescues all over the country. 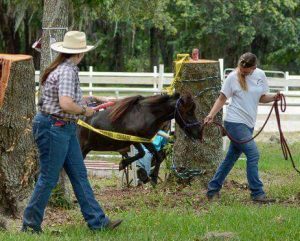 That volunteer participation was important in the case of Molly, a miniature horse abandoned with her mother at the clinic of the rescue’s veterinarian. A woman simply left Horton a voicemail and dropped off the horses, not following the approval process for surrenders. The clinic’s office staff assumed it was pre-arranged, since the clinic fosters horses frequently. On top of this surprise, Molly wasn’t easy to handle—she was pushy and dominant when she arrived at the rescue. After watching the training videos and going through the training with her, volunteers had her so well-trained that she was competing in horse shows with kids and was eventually adopted to a therapy program for children. From this moment on, choose not to let your past dictate your future. What is gone is gone – forever. Now is the time to move on, to do and become what you want: to be the best in any area that you choose, so you may design your own destiny. Here are a few helpful suggestions that you may take on board, and below you will find a couple of simple tips that can quickly move you in the direction of manifesting your destiny to accomplish many great things in your life. Plus more text here to take up a lot of space so that we can test the stuffs. Author HSUS_AdminPosted on April 28, 2016 1 Comment on Hello world!